WITH terror on his countenance and horror in his voice, Big Thumbs came running up the path from the river toward the Cave Village of the Flat Heads. He waved his arms wildly and shouted unintelligibly, and though the men and women of the village could not understand what he called to them, the alarm in his voice held them transfixed in fear while the children ran headlong up the paths that led to the caves in the cliffs and popped out of sight like so many rabbits. Og and Ru and Tao, with Big Tooth, the leader of the Flat Heads, sitting in the sun before the cave in which they lived together, sucking on the bones of a haunch of wild goat they had just roasted, leaped to their feet as the frightened man rushed up to the flat of hard-packed earth that was the council grounds. Seizing their stone axes they hurried to meet him. "Hold, Big Thumbs," shouted Big Tooth, "What is this that makes a frightened rabbit of you?" "The River God! The Black-One-Under-the-Water! He has got Crooked Leg by the feet, as Pong said he would. He pulls him under. He still clings to his log. But it is useless. He is doomed. Hark, you can hear him screaming in fear." From the direction of the river, as Big Thumbs spoke, came the frantic cries of Crooked Leg. They made the hairs on the back of Og's neck bristle in alarm, and caused Ru and Tao and Big Tooth to look at each other in consternation. They caused the men and women of the village to glance apprehensively toward the river, then look up the cliffs to the ledge before his cave where sat Pong, the Devil Doctor. But on his sinister, wrinkled face, they saw only a smile of satisfaction, as he nodded his ugly head as if almost pleased by the tragedy. Og saw and was angered. He pointed with his stone axe toward the river. "We may yet rescue Crooked Leg from this thing Pong calls the River God. Come! Down to the river!" Running hard he started down the trail up which Big Thumbs had come, with Ru and Tao, and Big Tooth following him, and when the rest of the Flat Heads saw them go they gathered courage too. Seizing whatever weapons were handy they started while Pong sat on his ledge and laughed a thin, cackling chuckle as he rocked his scrawny body back and forth. "Let them go! They can not help Crooked Leg. The River God has got him. He will get others, too, who follow the words of Og, and float on logs in the river," he chortled. But after a thoughtful moment he got up, drew his robe about his thin body and started down toward the river. SOMETHING had most certainly seized Crooked Leg and was trying to drag him to the bottom of the river, as the Flat Heads saw to their horror when they rushed down the steep bank to the water's edge. Out in the stream, well away from shore they saw Crooked Leg, his long, hairy arms wrapped around a log, his face twisted in pain and terror and his body completely submerged. Behind him the water was churned white save where it was crimsoned with blood, by the frantic struggles of some creature beneath the surface, that had closed its jaws on Crooked Leg's foot and was striving to drag him under. The picture of the man's fight for life out there in the dark sluggish stream made most of the Flat Heads stop on the bank and stare in terror. But the scene did not deter Og and his three companions. "Shove those logs into the river! Hurry!" There were several other logs, like the one to which Crooked Leg clung; smooth, well worn logs that had been used for boats. They were rolled up on the bank and it took but a few moments for Ru, Tao and Big Tooth to roll them back into the water and scramble astride. Og had already rolled one into the river for himself and, straddling it, was paddling with a broad stick toward the desperately struggling Crooked Leg. As he approached, now and again he could see a black, scaly head, and savage yellow eyes and occasionally the broad, flat tail of a huge crocodile break the surface of the river as it fought to drag Crooked Leg under, and though it was a fearsome sight, for Og, coming from the north, had never seen a crocodile, he paddled his log toward the turmoil, still encouraging Crooked Leg to hold fast and not allow himself to be dragged under. In a short time despite his unwieldy craft, Og reached the middle of the river, upstream of the struggle. He cast aside the stick he used for his paddle, then, and taking his stone axe from the girdle of wolf skin about his waist, gripped it in both his hands and held it poised, as his log drifted toward the encounter. Still Crooked Leg clung grimly to the log, his face twisted in pain, while more and more crimson tinted the frothy water. Still the great reptile twisted and struggled, lashing with its tail, and turning its body over and over as crocodiles do. Now and again its scaly head broke the surface and its great eyes glared. Og, drifting downstream, was soon within striking distance. A brief interval he watched and waited. The great head came up again. Suddenly Og swung his axe and crashed it downward. There was a water-muffled thump as the stone head struck the reptile's scaly armor, then a sudden fierce lashing of the huge tail. Crooked Leg's log suddenly began to bob up and down on the water as the great jaws released their hold, and the man with a cry scrambled up astride his craft, one mangled and useless leg dragging in the water. The turmoil in the river suddenly ceased. too, as the great reptile sank deeper below the surface. Og had no chance to get in a second stroke with his stone axe though he held the weapon poised for another blow as his log drifted over the blood-tinted spot where the creature had disappeared. WITH the release of Crooked Leg shouts of triumph came from the Flat Heads on the bank and from Ru and Tao and Big Tooth as their logs drifted down the current behind Og's. "Hi-yah!" yelled Ru, waving his stone ate, "That River God is dead. Og killed him with his skull splitter." "Another of Pong's Monsters is finished," shouted Big Tooth. But even as he shouted suddenly a strange hush fell on those gathered on the bank. Then awed cries escaped them as many of them pointed out into the river, for at that moment the crocodile's huge horny head broke the surface over toward the opposite bank and his great jaws opened as a bellowing roar sounded across the river while his green eyes glared balefully at the crowd of Flat Heads on the bank. At the same time a high pitched, cackling laugh echoed from the branches of a. big tree into which Pong had climbed to watch the battle. He sat in the crotch of a long limb that overhung the river, and watched with a sinister grin. "The River God is dead is he?" Pong chortled to Big Tooth. "Not that monster. He is cramat. He is holy. He is a god who can not be killed. See hum there staring at us with his evil eves. He is looking for those he will devour when next they venture onto the river." Then, turning, he addressed the people on the river bank. "You see that there is a River God as I have said. Perhaps now you will all listen to my words of wisdom before this river god and all the other gods become angry and destroy the People." The Flat Heads looked at each other and at Pong and it was evident to the Devil Doctor that they were frightened and willing to listen to him. He took immediate advantage of the moment. "Had Crooked Leg come to me to day I would have told him that this would happen to him. I might even have given him a charm to prevent it. But he did not come and you see how he has paid the penalty for flaunting me and my magic. Still I am not angry with him nor with the People. I will hold a council and tell the People what to do to keep this River God and all the other gods and devils from turning against them. I will hold that council now. Come. Follow me. I have spoken." And scrambling down out of the tree he started up the river bank leading the people toward the council grounds while Og and his companions looked at each other and shrugged their shoulders as the logs they bestrode swung slowly with the sluggish current back toward the bank. SINCE the three boys from the Cave People had showed the Flat Heads how they could sit astride logs and float safely on the river and how they could spear fish from the water by means of a flint-tipped fish spear that Tao had made for them, fishing had been popular with a few of the Flat Heads. Crooked Leg, a poor hunter because of his deformed limb, had been the most ardent fisherman of all, but there had been a few others, for the demand for fish was great when it was added to the food list of these people who had so recently lived in trees and subsisted on fruit. Fishing was not popular with Pong, however, and he objected to it as he objected to every other step of progress suggested by the three boys from the Cave Village. For one thing, each new method made the people less dependent upon him for counsel. In the old days the People had listened to his superstitions about gods and devils that dwelled in the forest and the mountains and in the water of the river, and they had paid him with their best food for charms to protect them against these evils. Og and his companions had scouted these gods and devils, however. They had proved that the monsters that were supposed to dwell in the misty volcanic valley were myths. They had persuaded the Flat Heads to cease living in trees and take up their abode in caves in a big fertile valley they had discovered. Pong still persisted in his talk of gods and devils, however, and when Tao introduced fish spearing from a log the Devil Doctor talked loud and long of the Black-One-Under-The-Water. He said the god of the river would be offended if men dared to float on the water and kill the fish that belonged to him and he predicted that one day the monster would rise up out of the water and drag some of these fishermen down. And now it had come to pass. Much disturbed, Tao lingered behind for some time after Og with Ru and Big Tooth followed the people to the meeting place, and alone on the river he studied one of the logs that was used as a boat, meanwhile, making marks in the mud with a stick, as he always did when trying to evolve some new idea. In fact the council was in session when finally he started up the river path and came within sight of the group gathered around the council fire at the foot of the cliffs in which the caves were located. "And you will take the best and the biggest share for yourself, won't you, Pong?" interrupted Big Tooth, who had his accustomed place in the council circle with Ru and Og beside him. "Yes, I will take a little for myself, Big Tooth, for I must be paid for the work I do," snapped the Devil Doctor. Then he added: "I will make magic charms that will protect the People so long as they come to me for advice and counsel. This I will do for the People even though they have listened to the strangers who have come to tempt them into doing things that arc evil, such as catching fish"
"Hold, Pong," interrupted Big Tooth, "catching fish from the river is no more evil than taking fruit from the forest. This is bad counsel to give to the People. Also it is wrong to tell them that they should not conquer and kill monsters such as that one that seized Crooked Leg by the foot to-day. That monster is not cramat any more than was the Mountain-That-Walked, and we killed him. The people should kill the Black-One-Under-The-Water. "He can not be killed," replied Pong, his countenance wrinkling stormily. "Og tried to kill him with a blow from his stone axe, but he did not even make a cut on him." "Oh, yes, he can be killed," exclaimed Tao, who had joined the circle by this time and stood beside Big Tooth, "he can be killed and I will tell the Flat Heads how to do it. First we will no more ride on logs with our feet hanging over the sides where this monster can seize hold of them. We will hollow out the logs so that men can sit inside them and protect their feet. We will hollow out great logs so that more men than I have fingers can ride in them. Then we will tie together long strings of bark in criss-cross fashion, this way"
Tao bent as he spoke and drew the hatchwork of a net on the ground. "We will tie together enough crisscross bark to reach across the river. Then we will spread it out in the water from one big log to another and paddle up the stream with it. The Black-One-Under-The-Water will see it but he will not be able to get under it nor over it nor around it and soon we will have him trapped. Then he will get entangled in it and we will drag him ashore where we will be able to kill him with our stone axes, and our spears and arrows." "Bah! This is more folly," shouted Pong angrily. "It will take a long time to tie such a criss-cross thing, and all the people in the village will be kept busy. They will die from hunger while they work on it. And besides how can these great logs be hollowed so that so many men can ride in them?" "I have thought that all out," said Tao, confidently. "The logs can be hollowed with fire and stone axes. While the men do this the women can gather bark and tie the criss-crosses. And after we have trapped this Black-One-Under-The-Water we can use the criss-crosses to trap fishes, too. At one time we will be able to catch enough fishes to feed the entire village." "This is evil. The gods will all be angry with the People. They will destroy the village, and I will not make a single charm to keep them from doing it. I have spoken." Indignantly he left the circle and stalked up the path toward his cave while some of the Flat Heads looked after him with uncertainty for a moment, then joined the rest who had gathered around Tao as he explained his plan more fully to them and to Og and Ru and Big Tooth, who were enthusiastic about it. The work progressed fast and as the canoes and the nets took shape more and more joined the workers, for they were afraid that those who did not work would not share in the big catches of fish that were expected after the monster was hauled from the river. So, with more workers, the net was ready by the waning of the moon. 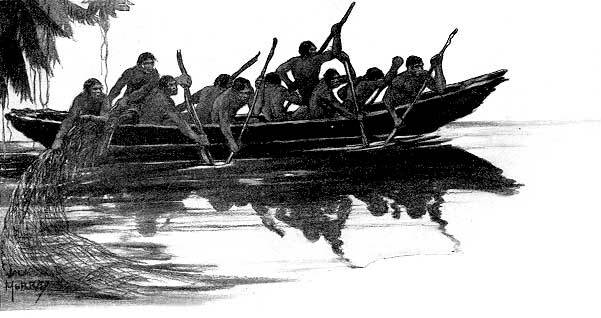 Soon after the two large canoes were finished and shoved into the water and ten men found that they could indeed float in the big hollowed-out logs, with their feet and bodies protected. To their joy they found that with ten of them wielding paddles this new craft could be propelled upstream or down regardless of the movement of the sluggish current, and this in itself was good, for it made them realize that they were masters over the river. But all this activity in the village, and particularly on the banks of the river, where the two big canoes were being built had disturbed the huge crocodile. Occasionally he raised his scaly head above the brown water and stared with baleful eyes at the workers. Each time he did, however, they shouted and shook their fists and threw sticks and stones at him with telling effect. He grew shy and furtive, and stayed under water longer, or hid. in the marsh on the edges of the stream. Pong was watching the day the net was completed and the canoes were launched and the expedition under the direction of Tao, with Ru and Og, and Big Tooth helping him, undertook the capture of the Black-One-Under-The-Water. The Devil Doctor climbed into the branches of the tree that overhung the river, and because it seemed a safe place others climbed into the tree with him, while the rest of the Flat Heads sought other trees along the river or vantage points that seemed to them well out of danger. None of them knew just what would happen when the River God made manifest his wrath against the people as Pong said he was sure to do. Under Tao's direction the craft paddled downstream to the foot of the pool in which the big crocodile was known to lurk. There the two canoes separated, with one end of the net held fast by men in either canoe and the meshes spread out across the river. The slow current made the heavy net belly out and Tao had thought to fasten stones to the lower edge to make that portion of it sink to the bottom. Thus he devised a veritable seine that took in most of the deep water of the pool, and he knew, as the canoe-men paddled slowly and laboriously upstream, that if the crocodile was in the deep water eventually he would be swept up by the net. The crocodile was in the deep water of the pool, all right, and the wily reptile was aware of the presence of the men with the net. As the seine moved up the pool he was forced backward into the shallows at. the upper end, where he knew that he would be cornered. He swam the length of the net in either direction looking for a chance to get under it or around it without exposing himself, but the meshes seemed everywhere. Gradually, as he was forced backward, his temper, short at best, began to rise. He snapped at the net and made rushes toward it. But each time he found it a strangely yielding thing against which. he could do nothing. He kept backing away from it until presently he was in such shallow water that his lashing tail and his knobby head suddenly broke the surface. As it. happened, he came up for the first time directly under the tree in which Pong and scores of Flat Heads crouched, watching. At the first sight of him a great shout was raised by the spectators, and as his big head and great green eyes appeared above the brown flood, some of them, and Pong among them, became highly alarmed.. They were not sure of their safety in the tree that overhung the water and began to scramble along the branches in a mad effort to get back to shore. Pong, thoroughly frightened, began to shout for right of way, because he was the Devil Doctor and a privileged character. But the Flat Heads paid no heed to his demands and with cries of alarm jostled him and shoved him, as they scrambled shoreward. The result was that suddenly the wizened old Devil Doctor lost his hold on the branch he was trying to travel, clutched wildly for a moment, then, with a shriek of terror and a loud splash, fell into the river, nor did he fall very far from the now enraged crocodile. 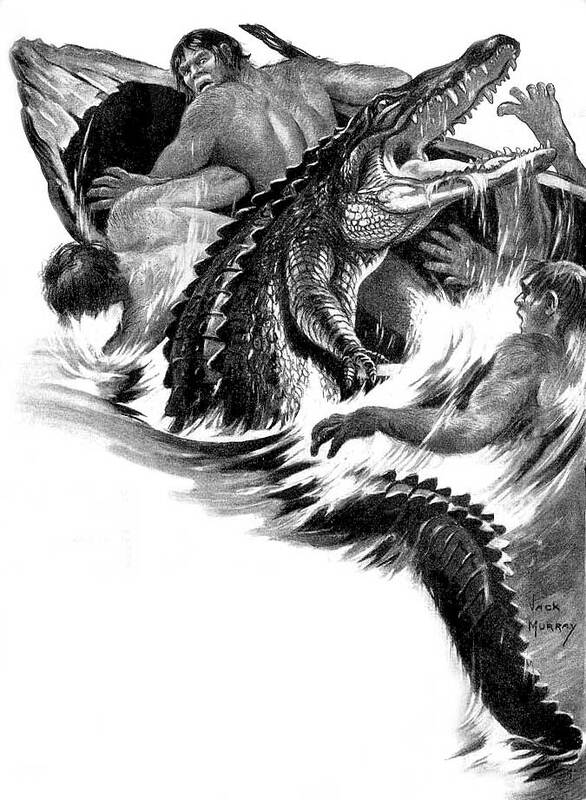 Indeed the big reptile saw him come tumbling out of the tree, and marking him as the only human on whom be could wreak his wrath suddenly started after him, making the shallows fairly boil with his lashing tail and his big horny feet, as he ploughed through the water with great jaws open to seize the terrified Devil Doctor. For a moment it looked as if the creature was going to reach his victim, for Pong, hampered by his robes, was floundering wildly in the shallows and trying desperately to drag himself ashore, adding screams of fear to the general din while the Flat Heads stood on the bank, staring with horror at the impending tragedy, and offering him little help because they were paralyzed by fear themselves. It was only good fortune and the fact that Og and Big Tooth, in the nearest canoe, thought and acted quickly that saved hum. It happened that the canoe in which they were paddling was the nearest to the scene, and Og, with shouts of command, turned the craft toward the floundering Pong and at the same time yelled to the paddlers to stroke. harder. The canoe shot forward and Og managed to send the blunt prow between the Devil Doctor and the now enraged crocodile. The creature, savage at being thus thwarted, with a roar of rage, hurled itself at the canoe, lifting his long black body half out of water to crash his weight down on the craft. His huge form hit the hollowed log with such force that the canoe upset and all its occupants were pitched into the shallow water. But the men who held the end of the net fortunately did not let go and the creature floundered into the meshes. As the other canoe shot forward after the first, the handlers of the other end of the net leaped into the shallow water and catching the reptile in the pocket of the net, began to wade ashore, as the first net men were doing. The crocodile was caught, nor was there any escape for him as he floundered and fought with impotent fury against the meshes that were fast entangling him. When the Flat Heads realized that the creature was actually trapped and almost helpless in the net they rushed down the bank and into the water, too, and seizing the ends of the net helped drag it ashore until presently the crocodile was beached and incapable of inflicting harm on anyone either with snapping jaws, or lashing tail. With yells of triumph then the Flat Heads fell upon the trapped reptile stabbing him with spears and pounding him with stone axes until they had killed this creature that Pong had said was cramat and could not be killed. Pong, however, did not stay. Instead, wet and bedraggled, he took himself to the ledge before his cave, where he sat the whole night through, watching bitterly the triumphal feast that followed, for in the net with the crocodile had been enmeshed enough fish to afford a big feast in honor of Og and Ru and Tao who had helped the Flat Heads to rid the river of the Black-One-Under-The-Water.